After one last sweep of the room, the adventurers progress upstairs to a curved hallway lined with barred windows on the left and wooden doors on the right. A little colder up here, the heroes can see out onto the snowy, barren expanse surrounding the tower. The first door they come across bears a sign that reads, "Trading Post," though in retrospect, it would've been amusing if one of the letters had been worn away so that the sign read "Trading Po t" instead. They open the door and pile into a relatively small room with a wooden counter, a pile of containers against the wall, and a small, terrifying man in a blood-red cap. PLAYERS: "Hello, creepy shopkeep. Have you any wares? We've never been shopping before and aren't looking for anything in particular. Also, we're very poor because we didn't go searching the crates in the basement for goods to sell you, so we're really not sure what we're doing here. Be afraid of us! We might attack you! Uh...just kidding. You are fascinatingly creepy." 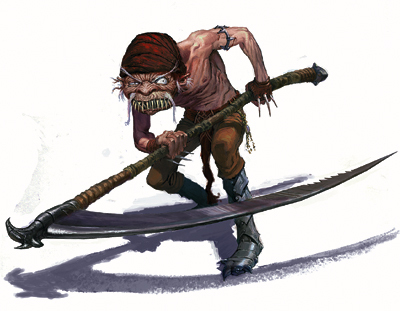 REDCAP SHOPKEEP: "Buy something, or I'll eat ya." The redcap continually needs to restrain himself from killing the party--though he talks openly about desiring to do so. Redcaps by nature are highly superstitious, and he's been told by the master of the tower that it's bad luck to eat the customers--something he continually needs to remind himself of whenever he begins to think aloud how refreshing it would be to cut them open and soak his cap in their blood. Before the campaign began, I had asked the players whether there was any equipment they'd like to see show up somewhere in the quest, perhaps something they couldn't afford to buy as part of their starting equipment. I got one request for an Armband of Elusive Action, which allows the wearer once a day to avoid provoking an attack of opportunity--for example, offering an opening for the enemy to strike her in the back as she turns away to disengage from melee combat. The shopkeeper is wearing one of these armbands and is willing to part with it; otherwise, most of his wares are all the typical equipment and items you could find in the Player's Handbook. Finally, after realizing that they are not obligated to patronize a shop simply because it exists, the party departs. They don't get very far down the hallway before they hear large footsteps coming toward them. Taking point, Sally the elan psychic warrior is the first to spot a large horned creature wearing a tattered old vest, like some sort of respectable butler polymorphed into a giant beast that's CHARGING RIGHT AT US!! Dia, the elf ranger, fires at the foe from a distance. Sally, carrying a weapon I've rarely seen player characters favor, is perhaps the first person in any of my D&D campaigns who has been in a position to mount a spear against a charge and deal double damage against the attacker. The minotaur goes down. Loot: 200 gold, a potion of Magic Fang, a masterwork buckler, and a key ring that had been hanging from his horn. Party divides up the loot and gains experience points from the DM...except the DM is a moron who can't read the XP chart, and wonders why the party is halfway through the tower and still hasn't leveled up yet. 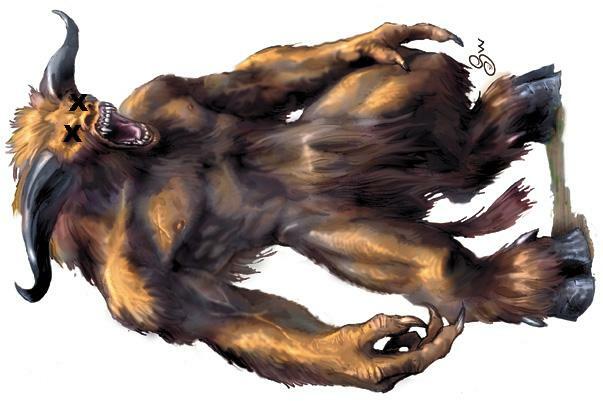 In a stroke of brilliance, the party drags the minotaur corpse to the trading post and sells it to the redcap shopkeep, who is overjoyed to have fresh blood, red blood. CREEPY OKAY MOVING ON. Continuing down the hallway, the party grabs a slip of paper fluttering against one of the bars, about to fly out the window. It reads, "...trace the lightning back to the clouds from whence it came..." Behind them is a door to a room filled with bunk beds sized large enough for half-giants, but seemingly comfortable for smaller creatures as well. The only item of real interest in this spotless room is another scrap of paper: "...and underground are hidden hazards unknown..."
The next cryptic fragment is found through the dining hall around the corner, and inside the adjoining smaller bedroom (presumably for the kitchen staff): "...flame which warms the frozen lands..." Across from the bedroom is the kitchen, with a sizable boiling stew pot fuming up some noxious smells. Sally, believing the stew is somehow poisonous (and not just a blend of really gross ingredients) decides to kick over the pot, setting herself on fire with the flames under the pot. She quickly puts herself out. She and Dia then find sharp kitchen knives (technically, masterwork daggers) and return to the dining hall with Salieri the half-elf cleric. Salieri has been mostly hanging back this whole time, but the player controlling him has been keeping track of the events of the quest. For posterity, for historical accuracy when referring back to an adventure in future quests, and for blog posts like this one, I like to designate a party scribe who'll jot down at least basic bullet points of everything that happens--though I've had one or two people turn their notes into hysterical memoirs of the character they played. I award 250 XP up front for whoever agrees to take notes, and grant them an extra 5 XP every time they gain XP for any other reason. Fair compensation for their efforts without putting them too far ahead of their fellow party members, I believe, plus the gratitude of the DM. Now, I wasn't expecting the players to run into the minotaur so soon, let alone take him down so effortlessly. I had hoped for at least a little bit of time spent fighting him somewhere around the dining hall area of this floor, or hiding from him in one of the bedrooms along the hallway. As they went to leave the dining hall, the characters were surprised to find that the minotaur was still very much alive, and was about to burst into the room for a real fight. What they didn't know at the time was that they hadn't killed the minotaur--only dropped him to negative hit points. Before he could bleed to death at -10 HP, the redcap shopkeeper fed a healing potion to his ally, as it's bad luck to let the groundskeeper bleed to death. That's not to say he didn't do anything creepy before reviving the minotaur, but I prefer not to think about what my murderous characters do when I'm not looking. So hey, the minotaur's back. Roll for initiative. Turn order is Dia, Salieri, Huggarth (the minotaur, whose name was never revealed during the quest), and Sally. The battle rages for eleven turns, or a little over a minute. During this time, Sally is engaging the minotaur in close-quarters combat while Dia and Sally learn about the penalties for firing into melee without possibly harming their allies if they miss. I like to offer the option of taking the standard -4 to your attack roll to shoot carefully enough to never hit your friends, or rolling as normal and then tossing a d6 to see what, exactly, you hit if you miss the target by more than 4. Despite dishing out some considerable damage, the half-blind minotaur is still not quite a match against the heroes. He bolts out of the dining hall and heads toward the trading post to enlist the help of Rowdy Roddy Redcap (another name that was never revealed to the players), who is more than excited to cut open customers who have become intruders. Joining the fray at the top of the turn order, the redcap helps to turn the tide of the battle in the bad guys' favor, but the DM is too much of a softie to let one of the heroes die instantly after receiving more damage in a single blow than anyone at this level has any right to receive in a normal combat situation--there may or may not have been a fudged die roll that allowed the character to survive at around -8 HP or so. Evidently the dice were trying to make up for several turns of the monsters whiffing thanks to unbelievably low rolls. Toward the end of the battle, the angry minotaur turns on the redcap, complaining that this isn't worth fighting and continually dying for anymore. With the extra damage dealt by the minotaur, the heroes kill the redcap--who instantly vanishes, leaving behind only a tooth--as well as the minotaur. With the trading post unguarded, the party finally behaves like normal adventurers and ransacks the place for everything it's worth. Loot: Ring of Protection +1, 10 crossbow bolts of Minor Blinding, a Cognizance Crystal (1 Power Point), an Amulet of Toxin Delay, the aforementioned Armband of Elusive Action, a potion of Invisibility, a scroll of Glitterdust, the aforementioned redcap tooth, dragonhide gloves, a rhinohide sack, 1801 GP, and a scrap of paper saying "...the rain that brings life to all nature..."
This time when consulting the XP table, the DM realizes that all this time, he has been a moron. Now reading the correct amounts on the experience table, he awards an appropriate amount of XP for an encounter against these monsters, and gives the players everything he had inadvertently cheated them out of before. At last, the party is at the appropriate level for that last battle. Seeing that it's a good time for the characters to take a rest and recover their HP--and a good time for the players to take a break, level up their characters, and go to bed for the evening--the party heads to one of the bedrooms, bars the door, and goes to sleep. When we return to play again the next day, I find the players have completely rewritten my campaign.